This website presents the Occupant Behavior (OB) research conducted by Tianzhen Hong and his team. Particularly, this work mostly focuses on energy-related occupant behavior using advanced data analytics or in building energy modeling. We would like to acknowledge that this work is funded by DOE's Building Technology Office through the U.S.-China Clean Energy Research Center. 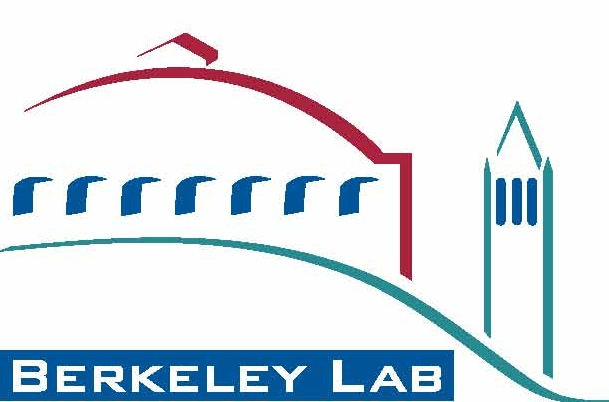 Additionally, we would like to note that at LBNL there are numerous other researchers who are experts in the general field of OB who are not represented on this site. Energy-related occupant behavior in buildings is one of six influencing factors of building performance, including climate, building envelope, building equipment, operation and maintenance, occupant behavior, and indoor environment conditions. Technologies alone do not necessarily guarantee low energy use in buildings. Behavioral solutions at low cost demonstrated significant potential energy savings. Clearly understanding and accurately modeling occupant behavior in buildings is crucial to reducing the gap between design and actual building energy performance, especially for low energy buildings relying more on passive design features, occupancy controlled technologies and occupant engagement. Daily interactions between building systems and occupants drive total energy use. People spend more than 80% of their time in buildings. Occupants’ expectations of desired comfort and satisfaction within their indoor environment drives the occupant to perform various actions, such as adjusting the thermostat settings to be warmer or cooler, opening windows for ventilation or cooling, turning on lights, pulling down the window blinds, consuming domestic hot water and moving around, to satisfy their physical and non-physical needs. These actions affect the built environment (e.g. indoor temperature, humidity level, lighting, CO2, etc.) and the energy use. Indirectly, this has economic, physiological and psychological impacts on the occupant. Building performance simulation (BPS) programs (e.g. EnergyPlus, ESP-r, IDA-ICE, TRNSYS, DeST, eQuest, DOE-2.1E) are widely applied to evaluate the performance of building energy systems and technologies. Currently, there is a large discrepancy between simulated results and actual building energy consumption, limiting the application and potential impact of BPS programs. The core issues are not with deterministic factors, such as the physical characteristics of building envelope, HVAC systems, lighting and electrical equipment, which have been investigated for the past several decades. Discrepancies mainly stem from a lack of quantitative research accurately representing energy-related occupant behavior in buildings. Currently, occupant behavior is represented in oversimplified and pre-defined deterministic schedules or fixed settings and rules, which are input into current BPS programs resulting in deterministic and homogeneous results ignoring the stochastic nature, dynamics, and diversity of occupant behavior. For example, occupants can open windows due to various reasons: (1) feeling hot – thermal comfort driven, (2) feeling stuffy – indoor air quality driven, (3) arriving in a space – event driven, and (4) natural ventilation - favorable outdoor conditions. Understanding the interactions between occupants and building technologies becomes critical in improving building design, operation, and retrofit. Different occupant behaviors require unique technical solutions, and different technical solutions will affect occupant behaviors, in a two-way feedback loop. Therefore, it becomes important to understand such interactions in order to balance building technology efficiency improvements with occupant comfort and health needs. Currently, there is public concern over the significant amount of energy consumed by the buildings sector, e.g. 40% in the U.S. and about 30% worldwide, with occupant behaviour (OB) being a key contributor. Often a disproportionate amount of attention is directed towards upgrading system or technological efficiency, resulting in an insufficient understanding of the impact of occupant behavior on building systems design and energy retrofit. This limited understanding often leads to inappropriate, overly simplified, modeling assumptions producing inaccurate expectations of building energy performance. The traditionally low priority placed on occupant behaviour research, has resulted in large discrepancies in building design optimization, energy diagnosis, performance evaluation, and building energy simulation. Additionally, there is a lack of consensus in common language, experimental design and modelling methodologies within the OB community. To contribute to codes and standards, such as California building energy efficiency standards Title 24, ASHRAE standards 55, 62, 90 and 189 via ASHRAE MTG.OBB (Multi-disciplinary Task Group on occupant behavior in buildings), and ASHRAE Handbook Fundamental. The general research approach follows the three thematic areas shown in the human-building interaction energy behavior loop. On the data collection front, data driven techniques such as real-time remote sensing to investigate occupants’ interaction with building technologies is at an all-time high, with more data on occupant actions collected than ever before. On the analytical and modeling front, advanced statistical, data mining, and stochastic modeling methods are being developed and applied to extract behavioral models from the experimental data. An ontology to standardize the representation of energy related occupant behavior in buildings has been developed. The combination of observation and modeling aspects will subsequently help to improve simulation techniques to quantify the impacts of the energy-related occupant behavior and to provide insights towards energy saving behaviors and robust architectural design. OB App: Development of a web application for simulating occupant movement and generating realistic occupancy scheduling considering diversity and stochastics of occupant activities. Occupant Information Modeling: Development of an ontology and XML schema to standardize the representation of occupant energy behavior in buildings for interoperability. 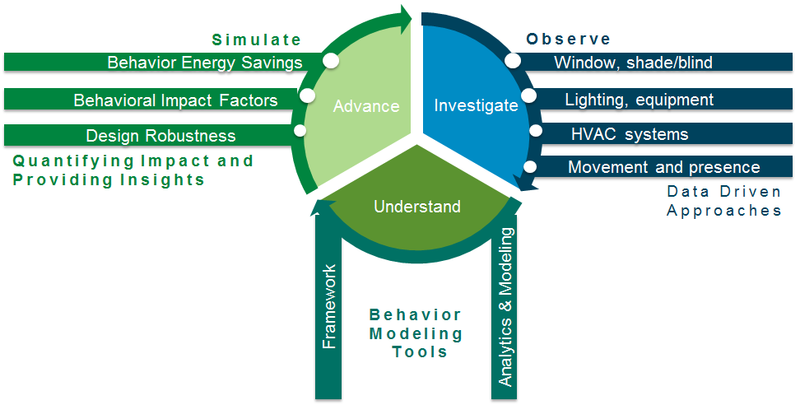 OB Modeling Tool: An Occupant Behavior Software, which redefines, in a more realistic fashion, occupant behavior inputs and co-simulates with EnergyPlus to capture impact of occupant behavior on the energy performance of buildings. OB Case Studies: Several case studies, collaborating with CERC industry partners, identify and quantify how occupant behavior impacts technology performance, and life cycle of buildings: design, operation, and retrofit.